There is a time during the summer called the “dog days of summer” – it’s a time when the weather is oh-so-hot and it begins creeping into how everyone is feeling. The hot can make you feel uncomfortable, sweaty, and even…a bit grumpy. In this week’s Martin & Sylvia: Saturdays! story, “The Picky Day”, Martin and Sylvia are feeling it too, and their grumpiness turns into picking – picking at, and on, each other – all day long. So how do we cure pickiness? By following Mama’s lead and making something beautiful! Dye your coffee filters. Place your liquid watercolors into a few shallow cups. If you are using food coloring, add 1-2 Tablespoons of water and 5-6 drops of food coloring to each dish. We used 4 colors of food coloring – red, yellow, green and blue. Dying one filter at a time, fold your filters in half, then half again, and one more time so that you have a fairly small triangle with the center of the coffee filter making the smallest point. Experiment with dipping one end of your filter into a single color and watch the color creep up your filter. Gently squeeze the excess color out of your filter before flipping it over and dipping it into a second color. Notice what happens when the two colors meet! Continue dipping and dying each filter until they are all saturated with color. Once they are all colored, put them out in a sunny place to dry. Coffee filters are very thin and dry in a matter of minutes (hooray!) Once they are dry, see how you like the coloring. Not quite colorful enough? Dip-dye them again! We dyed ours twice. Now it’s time to make your flower stems. Twist one end of a paper cleaner to make a small circle – about the size of a dime. Place two of your colored coffee filters one atop the other and carefully push the pointed end of the pipe cleaner through the middle. Gently pull the coffee filter through to the end and pull the filter up and around the pipe cleaner circle. Then wrap the stem of your pipe cleaner around the outside of the coffee filters just above the now-enclosed pipe cleaner circle so that you form your flower. Repeat with the rest of your coffee filters and pipe cleaners until you have a beautiful bunch of flowers! Now it’s time to make your wristlet. Lay your flowers down and using a basic over-under technique, braid at least 3 of your flowers together. When your braid is complete, wrap it around your wrist and twist up the ends to complete your wristlet. How lovely! Now, no matter what your mood, you’re ready to go about your day without feeling picky or grumpy. What will your new flower wristlet inspire you to make next? 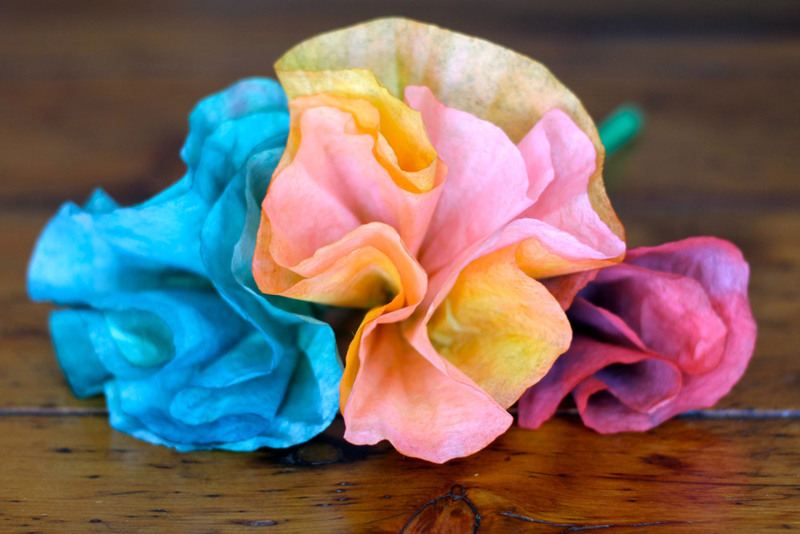 Now you know how to make a wristlet with your dip-dyed flowers, but what else can you make? Can you figure out the answer to Momma’s riddle and make your own super-long braided flower stem? What will you choose to wrap it around? What else can you do to your coffee filters to make your flowers look different? What happens if you cut the filters somehow? Or how about adding more filters to each flower? Give it a try and see what you can come up with! Martin and Sylvia are feeling grumpy and keep picking on each other. Do you ever feel picky? What makes you feel that way? How do you feel when someone picks on you? Making something beautiful is a great way to feel better when you’re in a bad mood. What else do you do to feel better when you’re feeling grumpy or picky?